An individual account is used to collect ALL email that are in the account and forward to a FIXED RECIPIENT list on your server. This may be one recipient or multiple, but they are specified in the Reroute to field and not extracted from the downloaded email headers. A catch-all account is a account where email to multiple recipients is delivered. Usually all the recipients are of the same domain, e.g the account will contain email to a@example.com ,b@example.com and c@example.com. If you wish to download all these email and forward them on to your server, use a catch-all account. Catch all accounts preserve the original recipients, so email to a@example.com will be forwarded to a@example.com on your email server. See the 'Reroute email to' setting for information on rerouting catch-all email to other domains. You can ensure that only valid, listed internal recipients may receive inbound email. This includes all email addresses configured for users, their alias, groups, routes and responders. Always will always include the recipients for the email from this field. First, Second, Third, Fourth allows you to prioritize this header for recipient collection. For example all those set to First will be checked first and all recipients collected from ALL those set to First. Then the second fields will be checked and recipients gathered. Last Resort will only include recipients from this field if no others have been found. If checked, the Delivered-To headers will be checked for valid recipients to route email to in addition to the other fields. Some pop servers setup these headers with the actual recipients the email was delivered to. If checked, the Envelope-To headers will be checked for valid recipients to route email to in addition to the other fields. Some pop servers setup these headers with the actual recipients the email was delivered to. 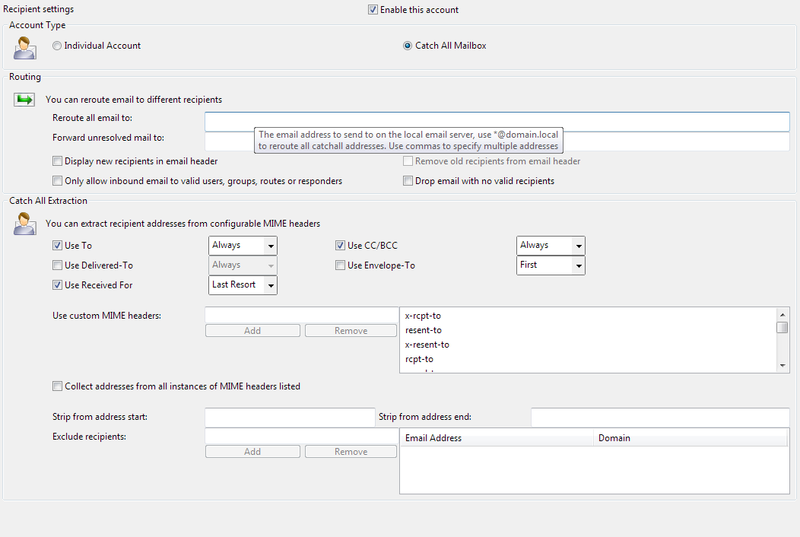 When fetching email for multiple recipients from one account, using 'catch-all', you can specify what MIME header field indicates the email address of the recipient. The MIME headers To: CC: and BCC: will automatically be used to find recipients, this setting allows an additional field to be scanned. When gathering recipient email address information from custom headers this can be used to collect addresses from multiple instances of the header. Use this setting to remove any unrequired text from the end of addresses.